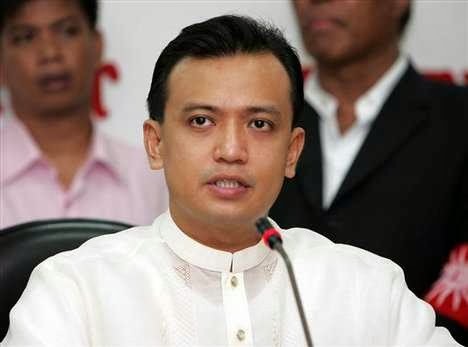 Manila, Philippines - Hopeless with the current state of national sports program, Senator Antonio "Sonny" F. Trillanes IV on Monday, February 10, 2014 announced he will push the creation of a Department of Sports to reform the administration of sports development in the country. Since 2011, Trillanes is eager to implement the creation of sports body as he continously make a proposal and series of discussions for the provision of the bill. "It is hard for us to attain status of sports powerhouse countries, which have established and well-developed national sports program, because there are untouchable crooks in Philippine sports. Unless we get rid of them, it is impossible for us to fix the current mess in our country's sports development." Trillanes said. "Under the existing law, the Philippine Sports Commission (PSC) is tasked as the lead agency for sports promotion and development. However, it cannot perform its mandate because it is being controlled and dictated by the Philippine Olympics Committee, which does nothing but to favor its allied National Sports Associations," Trillanes explained. Trillanes added that Senate Bill No. 649, or the Department of Sports Act, will hopefully resolve the current problem in the system and give importance to sports development in the country by creating an agency which will replace the PSC. The Department of Sports, being a cabinet level agency, will be given bigger power and enough resources to support sports development in the country. Under SBN 649, the Department of Sports shall provide the much needed leadership in sports development in the Philippines. It shall provide necessary impetus, direction, and policy guidance in order to improve the performance of the country in international sporting events and competitions. Said agency shall, likewise, take the lead in developing Filipino athletes to their fullest potentials. Trillanes further noted, "With this bill, we can cut the umbilical cord with POC, making the latter irrelevant. Department of Sports can now regulate the sports development in the country, without being influenced by POC." Trillanes has been an advocate of sports development in the country. Aside from bringing honor to the country, he believes that sports is relevant in youth development, and active and disciplined citizenry.